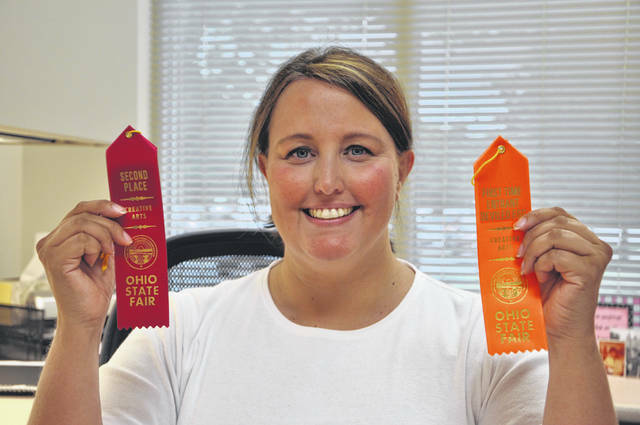 Angela Riley holds up her ribbon for second place and the award for best newcomer that she received after competing in the “Egg-citing and Devilishly Good” competition at the Ohio State Fair. Angela Riley was feeling good when she finished making her scotch deviled eggs with six minutes to spare during the “Egg-citing and Devilishly Good” competition at the Ohio State Fair over the weekend. It was when she walked around to look at the other competitor’s deviled eggs that she began to worry. But when fourth and third place were called, Riley assumed that her eggs weren’t going to place. Riley walked away with second place out of 13 competitors, and she also earned the award for a first-time entrant. The decision to enter the competition was motivated both by Riley’s love of cooking and her desire to try new things. During the competition, Riley said the cooks were given a limited number of eggs and a specific time limit, and tasked with coming up with an original deviled egg recipe. Riley said the reception at work hasn’t been all positive, though. Riley said she probably won’t do another competition and said she’s happy to have crossed the competition off her bucket list. Riley said the rest of her bucket list, for the moment at least, includes continuing to learn another language and travel.